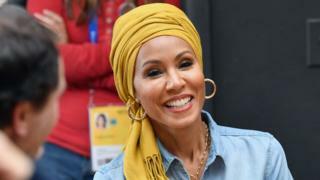 "I've been getting a lot of questions about why I've been wearing this turban," said the US actress, 46. "Well, I've been having issues with hair loss. And it was terrifying when it first started." The Girls Trip star says she first suspected she had the hair loss disease after "handfuls of hair" came loose in the shower. "I was just like 'Oh my god am I going bald?' It was one of those times in my life where I was literally shaking with fear," she explained. "That's why I cut my hair and continue to cut it." Other topics discussed have included coping with loss, motherhood and body image - with Willow previously disclosing she self-harmed as a child following the release of her debut single Whip My Hair in 2010. Smith admitted she finds her hair loss "difficult to talk about" as taking care of it used to be a "beautiful ritual". However, she said, the fate of her body lies in a "higher power" and that accepting it has helped her find perspective to deal with the emotional impact of alopecia. "People are out here with cancer, with sick children… I watch the higher power take things every day," she said, adding her hair loss pales by comparison. "When I looked at it from that perspective it did settle me."